Although the Southern magnolia is one of the best-known magnolia trees that grow in the United States, other species of this prominent ornamental tree do as well. Among them are a magnolia type called the Sweetbay and one with the odd name of Cucumber tree. The Bigleaf magnolia, Fraser magnolia and Umbrella magnolia are some other kinds of this very handsome species, a type of tree easily identified since many of its features stand out. The native range of these trees does not extend to the western half of the United States, with most relegated to the Southern or Mid-Atlantic states. The Sweetbay, Cucumber tree and Tulip tree possess the northernmost distributions, with the Tulip trees extending into New England and upstate New York, as well as the Great Lakes Region. The Ashe magnolia grows in the Florida Panhandle and into coastal Alabama. The Southern magnolia thrives from North Carolina southward to Florida and westward to Texas. The tallest of the magnolias in America is the Tulip tree, also named yellow poplar. It is among the largest of all hardwood trees native to the East, with some as tall as 150 feet. The Southern magnolia is the next tallest, with some reaching into the sky to heights of 80 to 90 feet. The shortest of the American magnolia trees is the Ashe magnolia, which seldom grows tall enough for anyone to consider it anything but a shrub. The flowers of the magnolia help to distinguish the tree from most others, as they are both large and beautiful. The Southern magnolia flower is so striking that it is the state flower in the Gulf States of Mississippi and Louisiana. It is as wide across as a foot and has between six and 12 white petals. It emerges in the spring and the tree can sometimes bloom throughout the summer. The flowers of the Fraser magnolia are yellow and those of the Tulip tree resemble tulips, except they are greenish-yellow. The petals of the Umbrella magnolia are long and narrow, with an unsavory aroma to them. 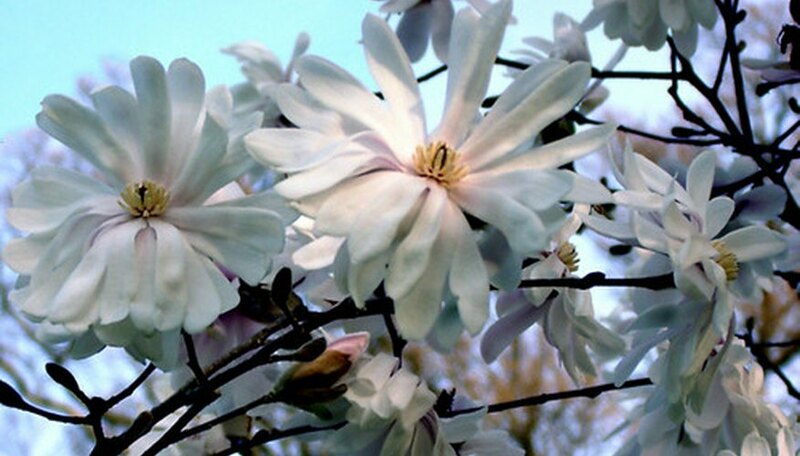 Magnolia trees are mostly deciduous, but some types may keep their leaves year-round, such as the Southern magnolia and the Sweetbay, in the southern portion of its range. Some of these leaves are odd-shaped, like the Tulip tree, which has leaves again resembling an outline of a tulip. Southern magnolia has large leaves, up to 10 inches in length and 5 inches wide, but they pale in size to those of Bigleaf magnolia. That species gets its name from leaves that can reach lengths of 30 inches and widths of 10 inches; Umbrella magnolia has leaves “just” 20 inches long and 6 to 10 inches wide. The fruit of a Cucumber magnolia tree resembles a cucumber, about 3 inches long, and it stays on the tree throughout the summer. Southern magnolia flowers develop into clusters of red seeds that birds enjoy. The fruit of Sweetbay is a very dark red and as long as 2 inches. The fruit of the Fraser magnolia can grow 5 inches in length and has the color of a red rose.